Garnier's latest offering in the BB cream department sees a product tooted as an "anti-imperfections" product. Now who wouldn't like that? The tube looks exactly like that of the first BB cream. Followers of Garnier will know that this is their third BB cream. The first BB cream being more for dry skinned ladies, and the second BB cream more for oily skinned ladies. This third BB cream is also for oily skins, but has the added benefit of containing 2% Salicyclic acid, mineral pigments, and an SPF of 15. Salicyclic acid help keep the skin clear and blemish free. I am not too sure what the mineral pigments do, but maybe it helps with mattifying the skin? Garnier says this BB cream will hydrate, even skin tone, keep blackheads at bay, mattify the skin, and cover redness. This BB cream ticks all the boxes for me, as my skin concerns are dehydration, enlarged pores, an oily T-zone, and redness. I've been using it for a few days and I love it. 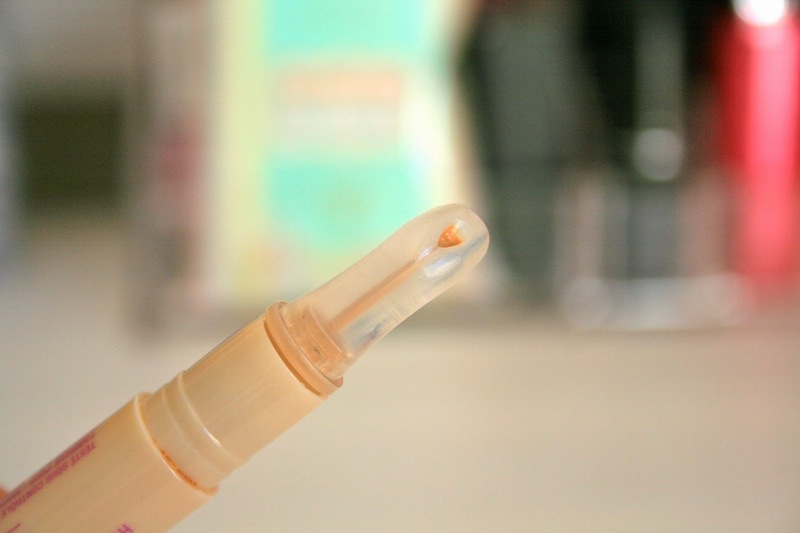 The tube is the same as the original BB cream, and the texture is also the same. It reminds me a bit of another old favourite: Sorbet BB cream. 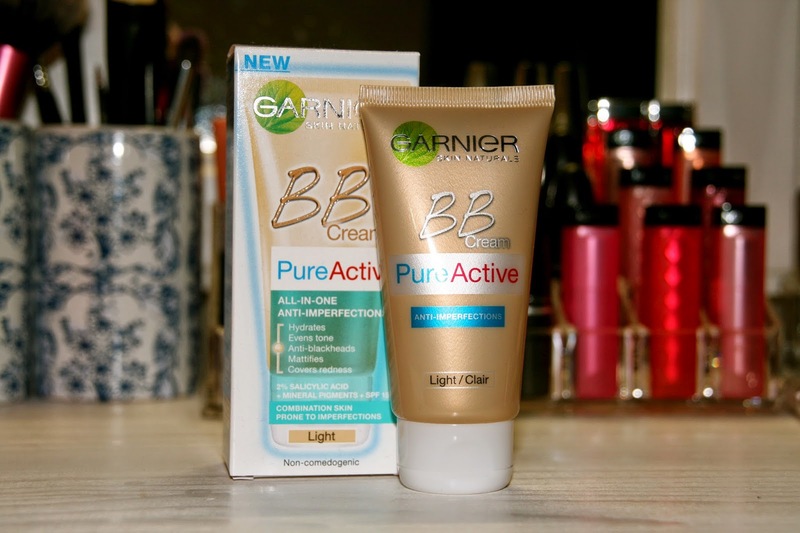 The Garnier Pure Active BB cream is a thick cream that smoothes onto the skin easily and it smells incredible. It smells fresh and clean, and it has the distinctive Garnier "blue and green product" smell. Vague, I know, but just go smell any Garnier product in blue or green packaging and you'll know what I'm on about. It hides my redness well and it doesn't feel like I'm wearing a mask. I was a bit hesitant when I saw the thick consistency, but just a drop is enough to cover my entire face and it smoothes on beautifully. The smell is also a bonus for me and it smells so clean and fresh that I feel I'm doing something good for my skin instead of just hiding it under a layer of something that's not doing it any favours. As far as I know this comes in three shades: light, medium, and dark. A tube retails for about R85 at Clicks, but Dischem will probably be a few rand cheaper. And if you catch it on a special, even cheaper! Have you tried this BB cream? Which one of the three is your favourite? While I'm not one to be fazed by keeping to certain colours during certain seasons, I think that keeping "spring/summer" colours and "autumn/winter" colours separate, it gives me a chance (read: forces me) to use all my polishes. I thought it would be fun to have a look in my "autumn/winter" stash and see which ones tickle my fancy for an autumn look. First up is the Revlon ColorStay Longwear Nail Enamel in 200 Stormy Night. It's a brown grey colour with a hint of purple, although it looks like quite brown in the bottle. The brush is nice and wide and two coats leave my nails opaque. I get quite a few days' wear out of this polish. Yardley Gel-Lac Nails in Plum is a beautiful dark purple plummy colour. The brush is also quite wide and one coat gives a nice opaque shine, but I always apply two coats (just in case). This polish lasts incredibly well and keeps on being shiny. Essie in Chinchilly is a pretty soft grey colour. The brush and formulation is what you would expect from Essie, although in my experience I would have liked the brush to be a bit wider. Zoya in Neely can be considered a spring shade as well as an autumn shade. Considering the cool tone of this colour, it fits more into an autumn shade for me. It applies well and you can see my in-depth review of it here. Yardley Gel-Lac Nails in Caramel is another Gel-Lac shade which I adore. It's a light brown caramel shade and is a beautiful warm colour. Below are the shades swatched on my nails, in the order they are mentioned in the post starting from my thumb to my pinkie. All swatches are two coats with no top coat. What's on your list of favourite nail polishes for autumn? Let me know in the comments section. Always on the lookout for a bargain, I saw this at Dischem and went to sniff it after reading Chantelle from Not Another Poppie's review. For the grand total of R89.95 you get a 50 ml bottle of perfume. It's a cute disk-shaped bottle and the box looks very colourful and summery. The smell is fresh and citrussy and I absolutely loved it from the first whiff. 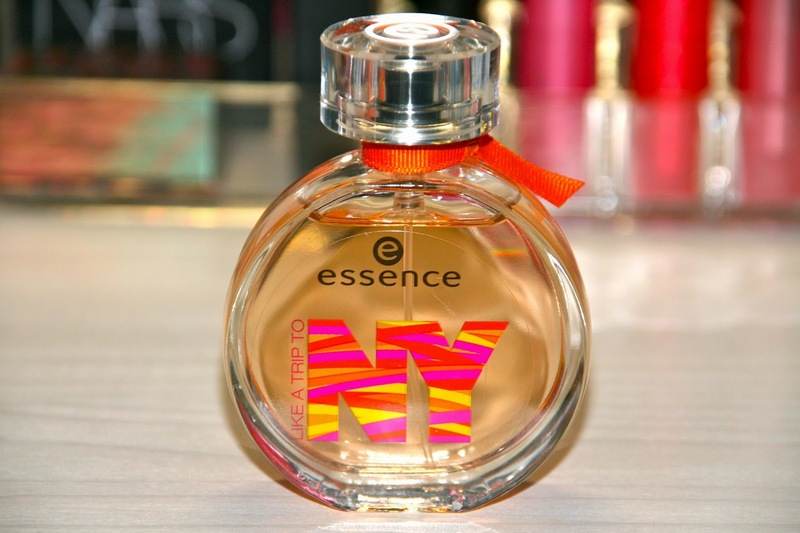 It smells almost exactly like the first grownup scent I ever owned: the original DKNY in the skyscraper bottle (which is probably where "Like a trip to New York" comes from). Being a cheap perfume, I wasn't expecting much, but the scent lasts for a good couple of hours and then fades away instead of becoming gross. Not much more that I can say except: 1) it's cheap as chips, 2) it doesn't smell weird or gross after a few hours, 3) it comes in a cute bottle. I only saw it at the one Dischem, but then again, after I purchased it I didn't go looking for it again, so maybe it's still on shelves. 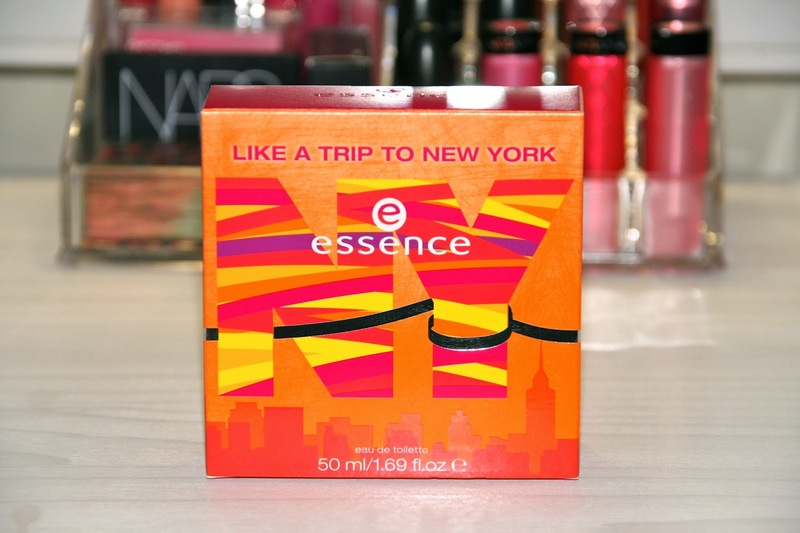 Have you ever tried essence scents? Did you like it? Let me know in the comments section! It's important to regularly exfoliate your skin, especially in the colder months when skin tends to become dry and flaky. I've been trying a couple of different scrubs the last few months, and will probably continue to do more so in the coming winter months. The air up north is much drier than in the Cape, so it's even more important to regularly exfoliate. I normally don't have problem-skin, but my skin gets extremely dry, flaky, and itchy in the winter. My current favourite scrub isn't the most abrasive scrub I've ever used, but oh boy, it's a goodie. 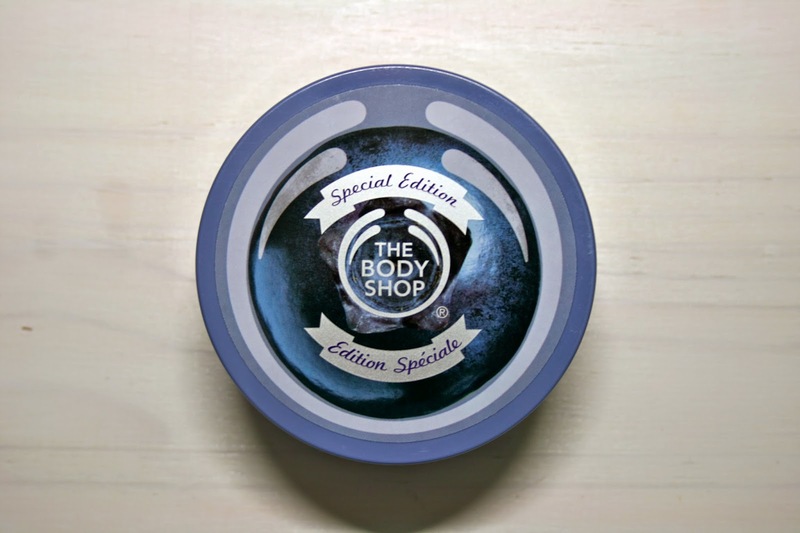 The Body Shop's limited edition blueberry body scrub geleé looks and smells exactly like blueberry jam. My mouth waters every time I open the jar, and I'm considering buying about three more tubs since I'll be gutted when this limited edition is finished. 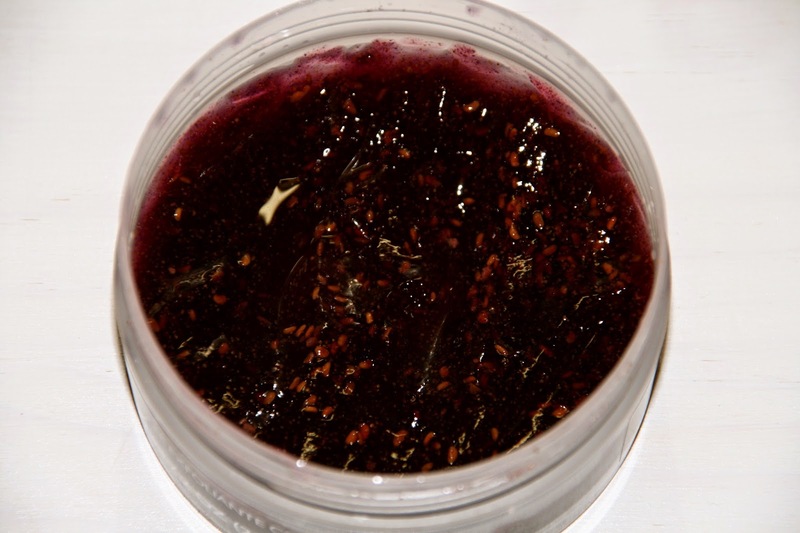 The texture is different to the normal Body Shop body scrubs in that it is more of a jam consistency than a thick scrub. It contains blueberries (so not just a blueberry fragranced scrub) and you can see the little pips in the scrub. Each tub also contains Community Fair Trade honey from Ethiopia. Honey and blueberry...now how can this ever be a bad combination? As I've mentioned already, this is not the most abrasive scrub I've ever used, it is quite gentle. I probably won't use this on lizard legs or the like, but if you're someone who regularly exfoliates, say, three times a week, then this will be the scrub for you. You can buy this from The Body Shop for R90. Sale alert for LYB members: when you buy R350 worth of products between now and 20 April, you get R100 off. I say it's time to stock up on scrubs and butters! Have you used this scrub? Do you have any other scrub recommendations? I'd love to hear from you. This is not really that big of a face-off, as the two products in question aren't expensive, and the difference in price between the two isn't that big either. However, I though it would be a fun comparison to do, as I have been trying these two out for months and can see slight differences. 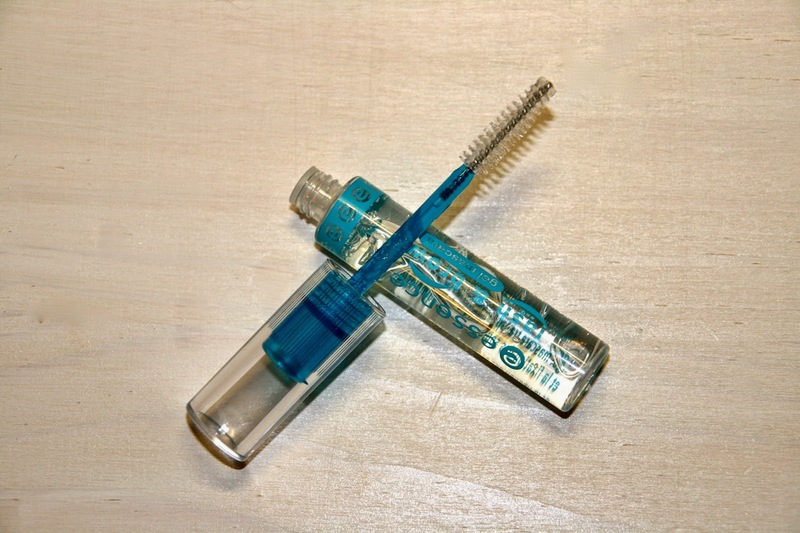 This brow gel comes in a clear tube with a spoolie applicator. 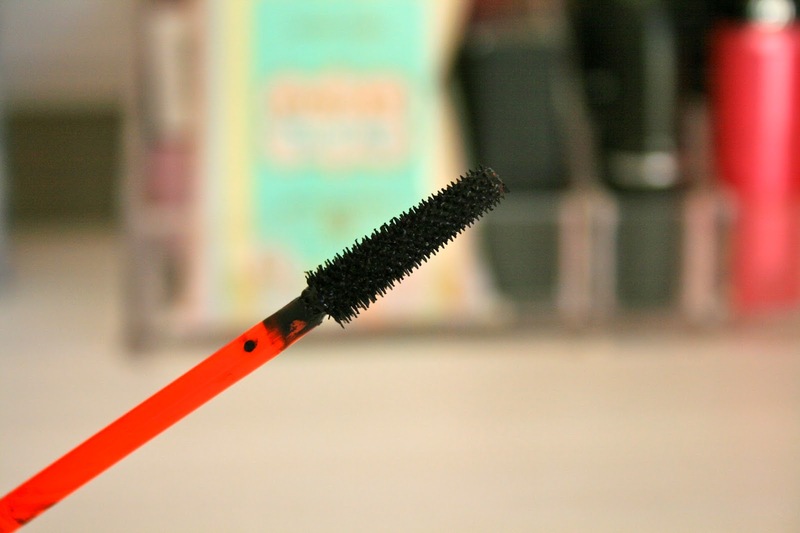 The spoolie is quite thick, and is about the length of an average mascara wand. The brow gel works fine and I don't have any problems with it except for the length of the spoolie. For the life of me I can't understand why brands make their spoolies so long. I mean, for applying mascara it's fine, but no one's eyebrows are THAT broad (I hope?). I have the same problem with my MAC brow set. I get more product on my brow bone than I do on my eyebrow. The tube also gets dirty quite quickly, and it looks gross after a few uses, but I suppose there's nothing to be done about that. This costs R32.95* at Dischem and Clicks. 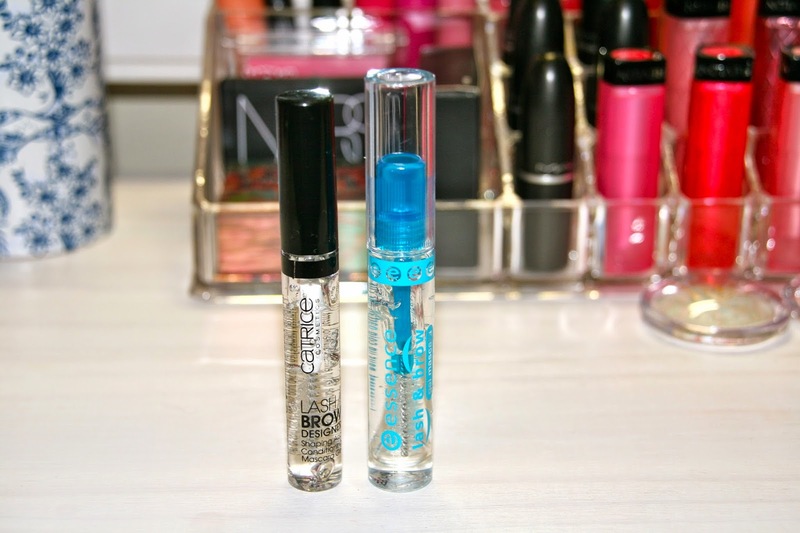 The Catrice brow gel also comes in a clear tube with a spoolie applicator. The tube is slightly more narrow than the essence one, and the spoolie has a brow comb on one side. This costs R49.95* at Dischem. 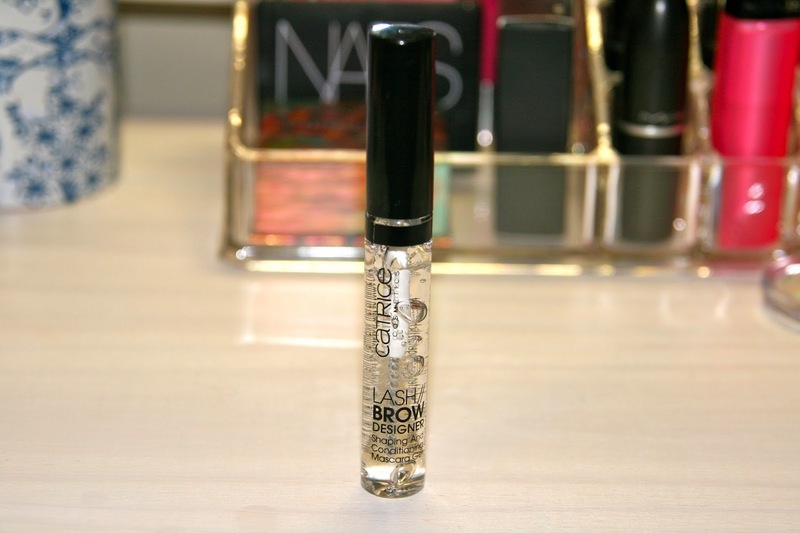 Even though the Catrice brow gel is R17* more expensive than the essence one and is only available at Dischem, I like it the most. For me it all comes down to the spoolie. Although both products' spoolies are way too long, I find that the spoolie on the Catrice brow gel shape my brows much easier. Have you ever used any of these products? Which one is your favourite? Or do you have another favourite? Tell me in the comments section! * I'm not 100% sure these prices are correct, but I will update once I've checked at Dischem. I am always on the lookout for a new primer, and I love browsing the Catrice counter at Dischem. 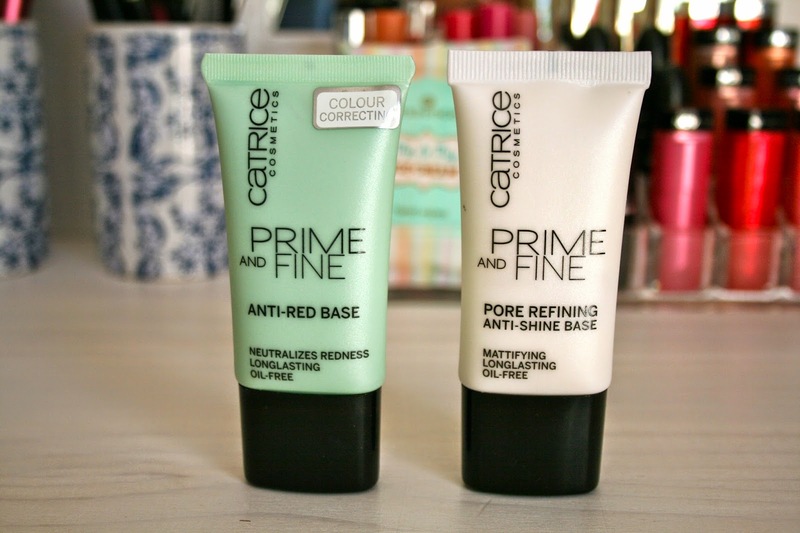 I was delighted to see two new products on the shelves, namely the Prime and Fine Anti-Red Base and the Prime and Fine Pore Refining Anti-Shine Base. I started with the green bottle, the Prime and Fine Anti-Red Base. The packaging reminds me of the Smashbox primers. 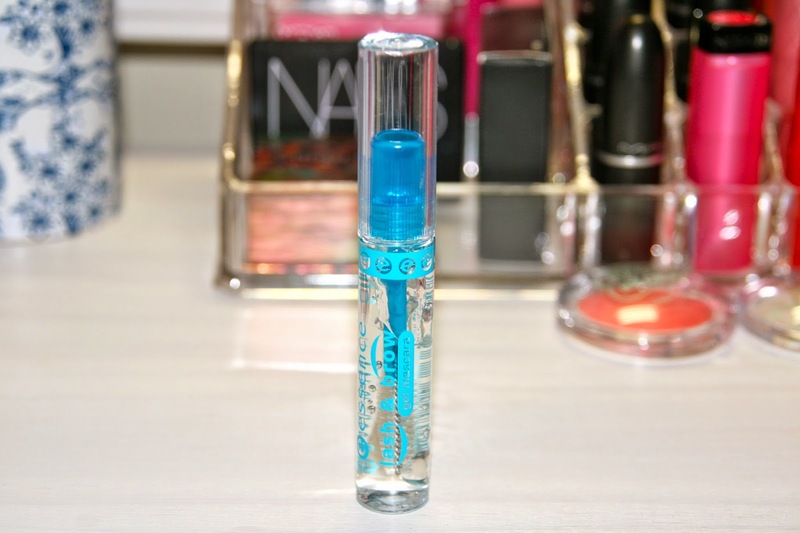 The texture is a gel cream and it applies easily, but not with as much slip as the Smashbox or Stila primers. I had high hopes for this primer, as I need something to cover the redness on my cheeks. I was unfortunately quite disappointed to discover the amount of glitter in it. Yes ladies, I said "glitter". 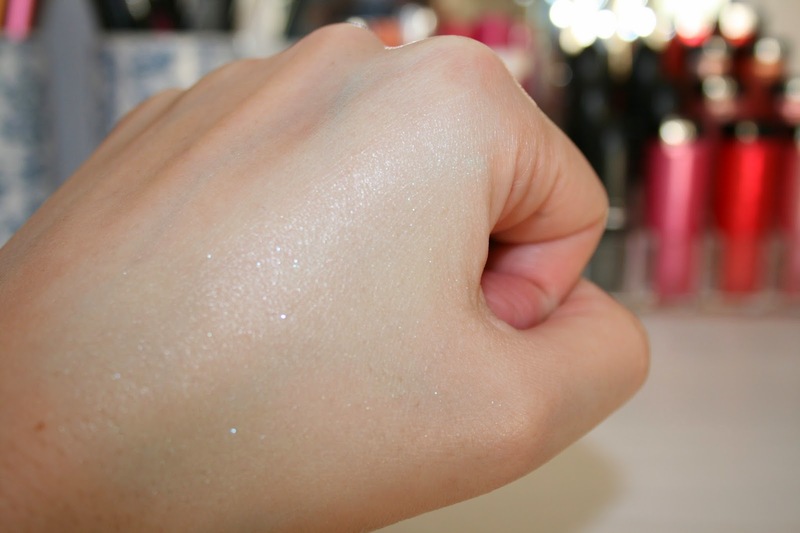 It's not a radiant shimmer or a glow, it's glitter. In the name of research I applied it all over my face, just as I would with any other primer. For the rest of the day I looked like a character from Twilight filmed in the sun. Ok so it's not quite that bad, but you get the idea. Below are two photos of the anti-red base. The first shows the colour and the texture of the primer, the second shows the glittery blended result. 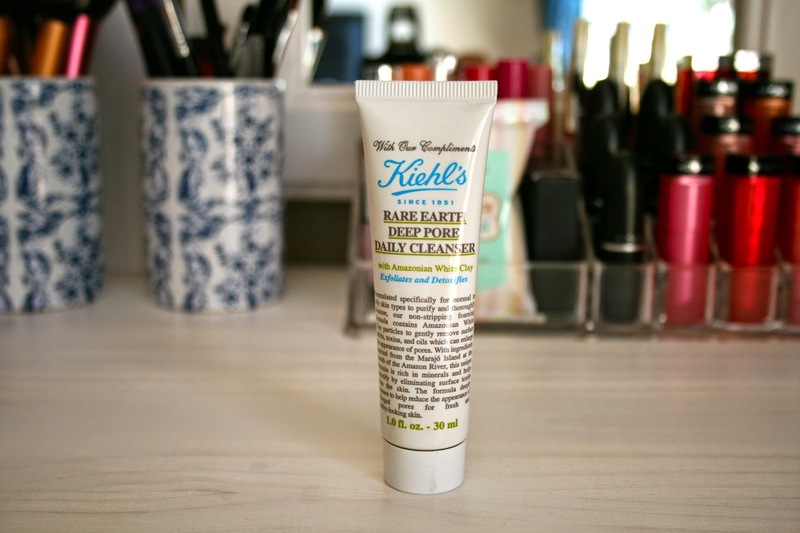 After the mishap with the anti-red base primer, I tried the Pore Refining Anti-Shine Base. The texture is also a gel cream and it is white. This reminds me of the Smashbox primer that I have (the one in the old boxy packaging). This also doesn't apply quite as easily as the Smashbox and Stila primers. I wore it under foundation and under CC cream on separate occasions, and I can say it did a fairly good job of mattifying my skin. Usually I am an oil slick by 11:00, but with this and some setting powder after foundation/CC cream, I found it to last until about 14:00 or 15:00. I think these primers (maybe even the glitter ball one) would work beautifully when paired with the rest of the Catrice Prime and Fine range. It is also a lot cheaper than any of the other primers I have come across. The Pore Refining Anti-Shine Base gets a thumbs up from me. These primers are available for R77.95 each at Dischem. Have you used any of these primers? Let me know in the comments section! 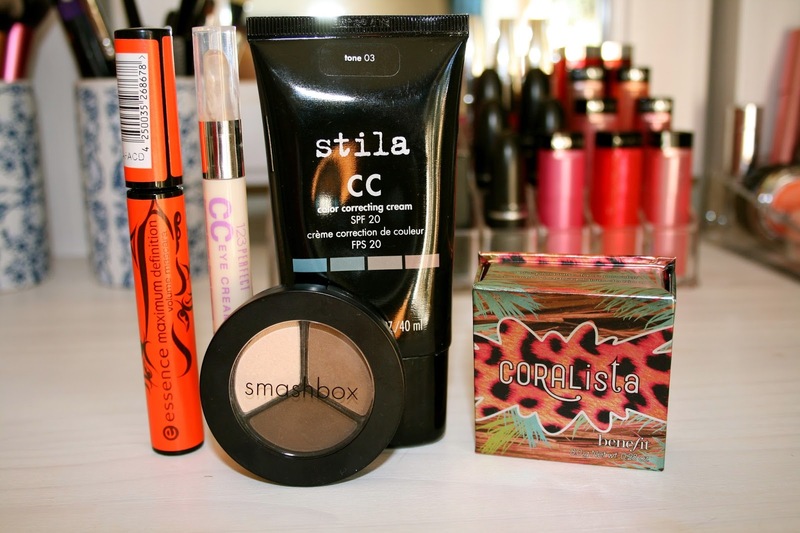 While rounding up my most-used products of March, I couldn't help but think how the heck is it April already?! It feels like the other day we came back from Christmas holiday and now it's almost Easter! My favourites from March include a skincare product, a hair care product, a couple of makeup products, and one hair gadget. Let's get stuck in! I received this 30 ml sample many months ago along with a purchase from Kiehl's. I started using it most mornings and I absolutely love it. It's a very light, pottery clay coloured facial cleanser. The texture is difficult to describe. It's not thick like a clay mask, but it's not like a lotion either. It's slightly gritty and has a light smell. It contains Amazonian white clay and exfoliates and detoxifies. It's best used on normal to oily skins, and I have combination oily skin, so this is pretty perfect for me. I use this in the mornings and apply it to wet skin. I gently massage it in and rinse it off with warm water. My skin feels clean and smooth and refreshed. As soon as space opens up on my cleanser shelf (I have a lot of cleansers on rotation), I am definitely buying the full sized version of this. 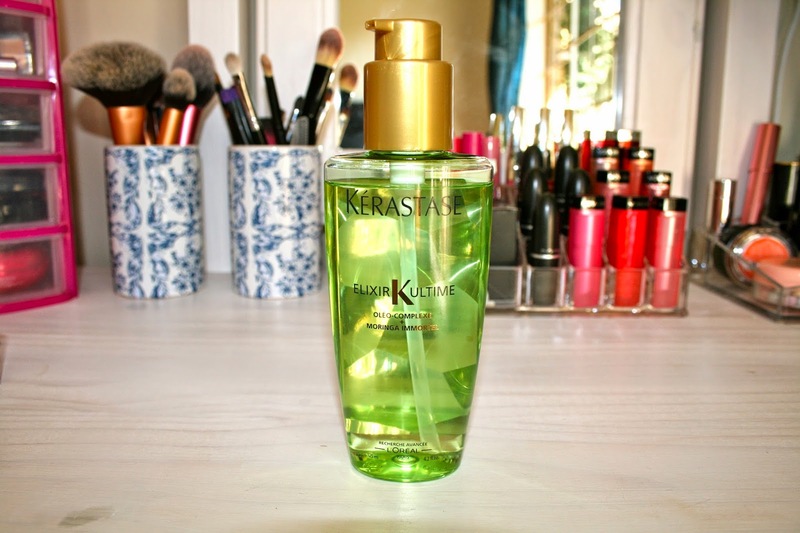 This hair oil normally costs around R450, but RetailBox and EverythingHair recently had huge sales on the Kérastase Ultime range, so I bought two bottles (I think I paid R99 per bottle). The pump bottle works great, as you don't need to screw on caps with oily hands. The consistency is light, but this is definitely not a dry oil. Halfway through blowdrying my hair I rub one pump of oil between my hands and work it through my hair, focussing on the ends and the lengths. I then continue blowdrying my hair until it is completely dry. The smell is amazing and makes my hair smells like moringa flowers for the rest of the day. The oil leaves my hair soft and shiny, and tames fly-aways without leaving my hair greasy. 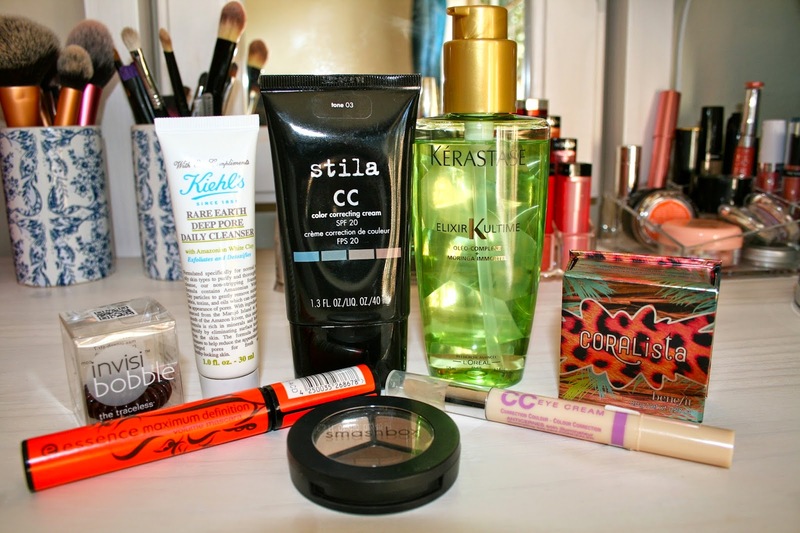 My makeup favourites for the month includes the Stila CC Cream. This is an amazing product to use when you don't want to layer on the makeup, but still want to hide a few blemishes and a bit of redness. 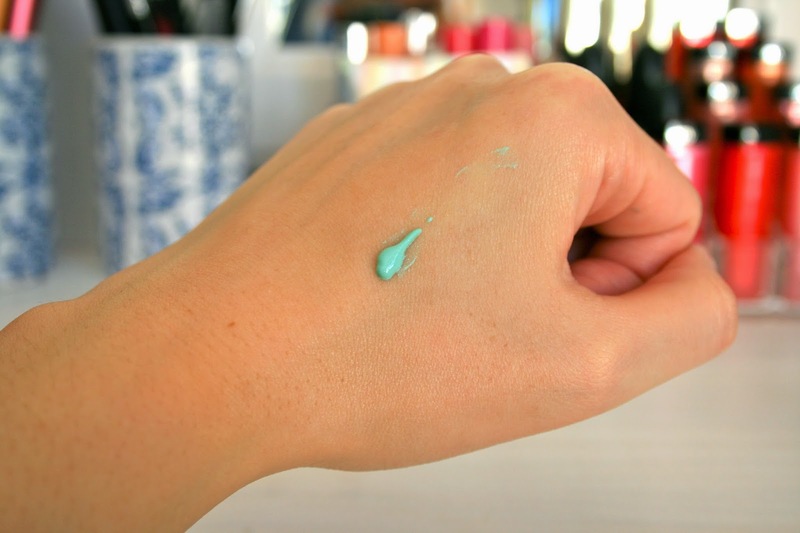 The CC cream comes out of the tube as a light grey product, but it buffs into the skin beautifully. I've been using this most days, and sometimes I like to mix it with a drop of the Stila Bronzing Beauty Balm for a sunkissed glow. I have already done a blog post on the Benefit Coralista blush here, so I won't harp on about it. It's a lovely glowy peach colour and I see myself using this well into autumn. On my eyes I've found myself wearing the eyeshadow I bought from the lovely Nicole's latest blogsale a lot in March. 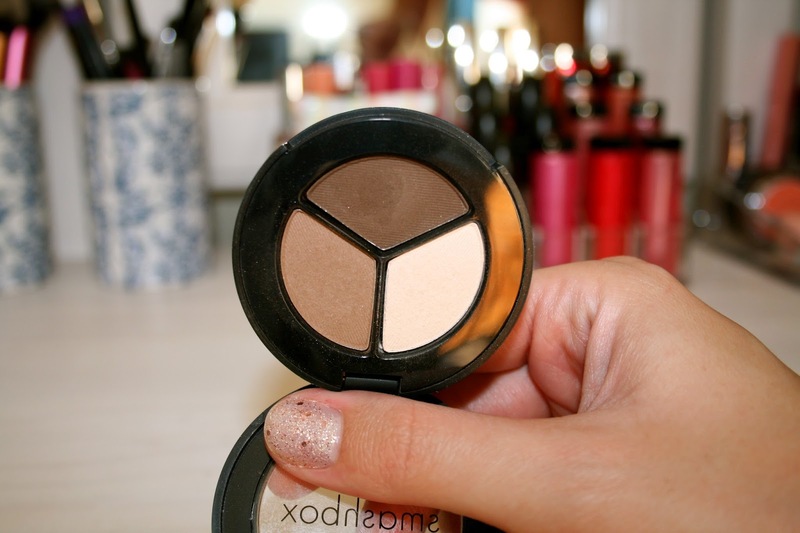 The Smashbox Eyeshadow Trio in Filter is a beautiful trio of matte browns. There is an off-white colour called Vanilla, a light brown called Sable, and a dark brown called Sumatra. The shadows are buttery and blend beautifully. The compact shuts tightly and it's fantastic for travelling. The mascara I've been loving this month is the Essence Maximum Definition Volume Mascara that I got from the sweet Johlet in a box exchange. 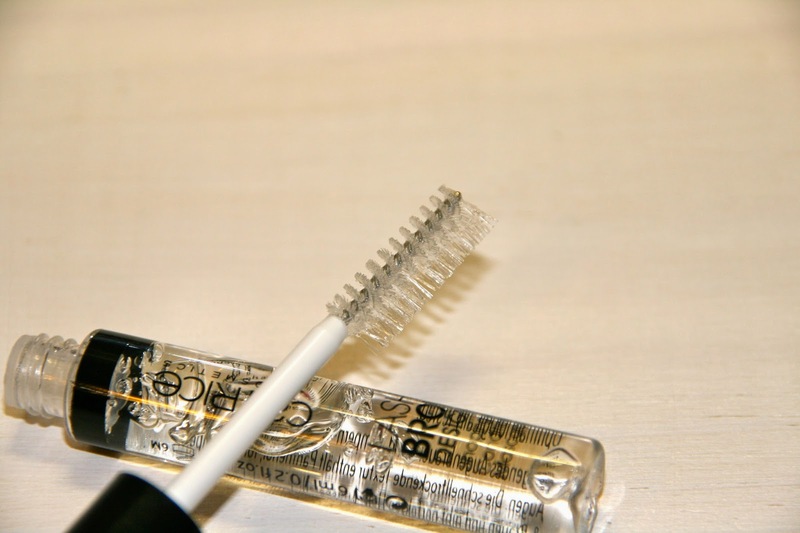 The brush has short plastic bristles, and the formula is not too dry, and not too wet. Normally I'm running late in the mornings, so I can just sweep this wand through my lashes without covering my entire eyelid in mascara, or poking myself in the eye (yes, it happens). I have naturally long eyelashes, so this gives them good volume. All in all, a lovely mascara, and being from Essence, it's sure to be very reasonably priced too. The last makeup favourite for this month is the Bourjois CC Eye Cream. This product has revolutionised my under-eye concealing. I have just about given up on under-eye concealing, as nothing was really working (or I wasn't using it properly). This is a colour correcting concealer, basically a CC cream for your eyes. Genius! The applicator is perfection. Instead of a nozzle that continues to bleed product long after you're done, this rubber tip only lets product out when you twist the tube on the bottom. It's hygienic and the rubber tip is soft on your skin. The product is quite liquidy but blends beautifully into the skin. I have found that if I don't use a rich eye cream with my morning skincare routine, the concealer does settle into the fine lines below my eyes. That being said, if I apply the concealer and set it with powder, it lasts the whole day. That to me is quite a fantastic thing. 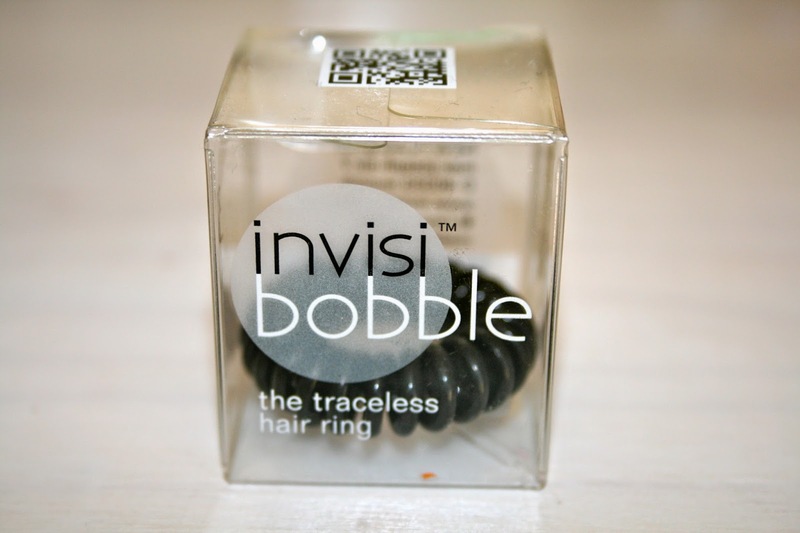 The last product in this month's list of favourites is the much hyped-over Invisibobble. Long haired ladies, you need this in your life! I don't know about the rest of you, but I go through hair elastics like it's going out of fashion. If I don't lose them, they snap. The original Invisibobble comes in a couple of colours, and you get three bobbles for R80. There are cheaper knock-offs, but I haven't tried them yet. The Invisibobble promises to leave no trace on your hair: so you can tie your hair in a bun for a few hours and not worry about it leaving a weird kink when you take it out. All in all, a game changer. So that's it for this month! Have you tried any of these products? What did you think? What's your number one favourite product for last month? I love hearing what other people rave about. In case you haven't noticed, this week is all about brushes on Suzy Q-tip! If you missed Monday's post, you can read all about brush washing here. I've been on the lookout for a good stippling brush and a proper eyeshadow brush for some time. I have the Real Techniques buffing brush (which I adore), but I felt like I needed a stippling brush in my life. Quite a few blogger ladies and Instagram frequenters have mentioned Turquoise Studio as their go-to place for buying Sigma makeup brushes. The Sigma brand is known worldwide for their high quality products, especially their professional quality makeup brushes. As far as I know, Turquoise Studio is the only online retailer in South Africa that sells Sigma brushes. According to their website, Turquoise Studio was founded by Nina de Winter-Peer because she was frustrated at not being able to purchase high-quality well-priced makeup brushes locally. She wanted to provide this service to South African women. This from Turquoise Studio's website: "As with any activity, having the right tools means that applying your make-up will be a process that will be enjoyable and yield the results that you want. Turquoise Studio aims to not only be a source of luxury make-up tools, but also a resource that will teach you how to easily apply your make-up so as to rival any make-up artist." After a quick sign up process, I placed an order on Saturday evening. The ordering process was quick and painless and I immediately received payment confirmation. Two days later (Monday) I received an email containing my tracking number. The tracking website was updated quite a few times during Monday and Tuesday, something that I haven't seen with any of the other courier companies (big ups to FastWay Couriers). Tuesday afternoon I received a call that the package was at our complex. 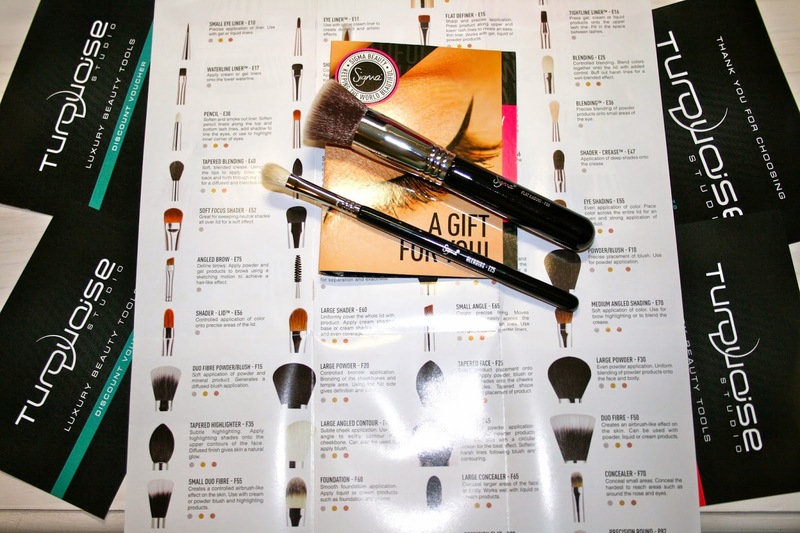 The brushes were packaged separately, in their own plastic sleeves and then in bubble wrap. I ordered the Sigmax F80 Flat Kabuki and the Sigma E25 Blending Brush. The F80 is a dense stippling brush, and the E25 is a dupe for the MAC 217. I received a thank you card, as well as three discount vouchers-- a 15% off voucher for me and two 10% vouchers for friends. I also received a Sigma pamphlet with pictures and descriptions of ALL their brushes (I wouldn't even know what to do with that many brushes!). They also threw in a cute pink E05 eyeliner brush to thank me for shopping with them. Would I buy from them again? Absolutely! 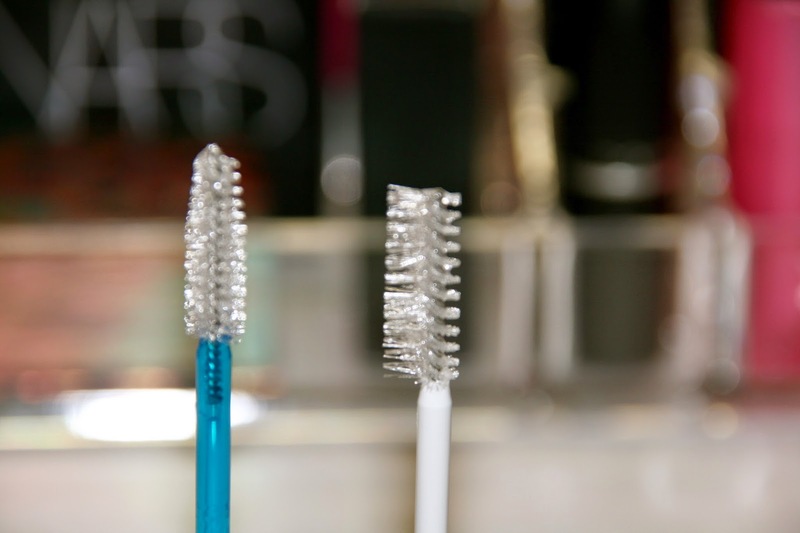 Makeup brushes are expensive, but I believe that if you buy high quality brushes and look after them (such as washing them correctly), they will last for years. Also, if you compare Turquoise Studio's prices with that of, say, MAC brushes, they are considerably cheaper. And with free delivery, what's not to like? As mentioned above I have two 10% discount vouchers to give away. Thanks to Anye I received 10% off my first purchase, and I would like to pay the kind gesture forward. If you would like a discount voucher, leave a comment telling me which brush(es) you would buy from Turquoise Studio. First two comments will each receive a voucher.